This is basically copy-pasta from the Thingiverse post, which I will probably be keeping more up-to-date than I will this post. However, I am posting here for posterity and because I always post here. 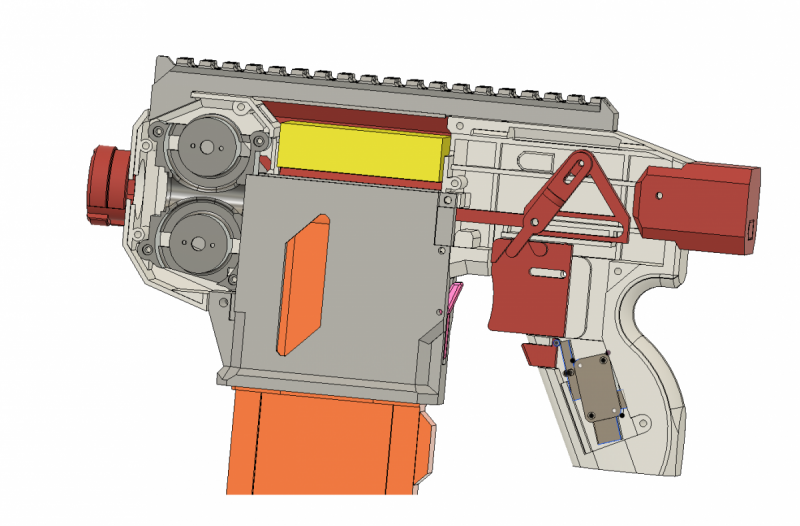 Magwell.stl: Structural piece that slots and bolts into the flywheel cage-cage and grip frame. Print standing up. 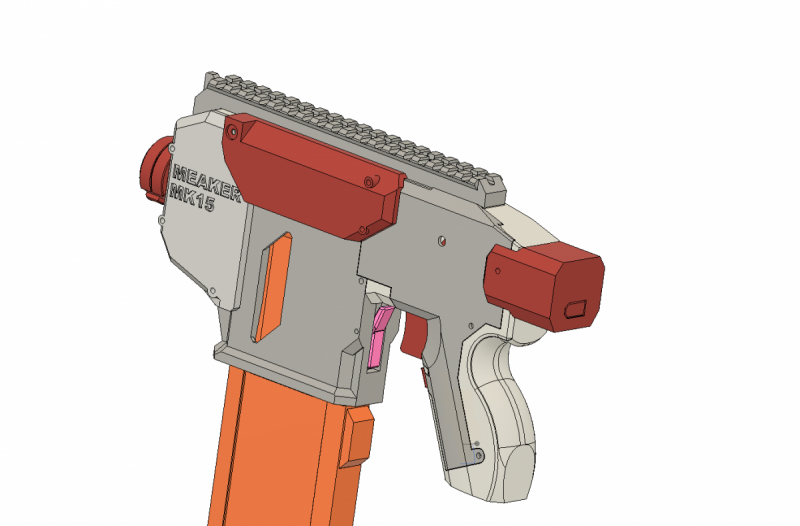 ClipRelease.stl: Combined with magwell, this allows NERF-brand (or similar) N-strike Clips to lock into the blaster. Should also work with off-brand mags. Magwell_Cover_L.stl & Magwell_Cover_R.stl: One of these is meant to be structural, the other should be possible to remove without disassembly. The one that is removable has area behind it for an extra nut on the bolt holding the assembly together. Barrel_Lug.stl: An optional part that should allow you to attach NERF-brand or compatible faux barrels for optimal tactics. Also just looks good IMO. It should print with the screw recesses down, the hexagonal cutout should allow a GEN2 OFP cage to press fit onto it. The screws should still be used to ensure accurate positioning and strength, may require drilling to fit. FLYWHEEL_CAGE-CAGE.stl: Front end structure. Attaches to pic rail, magwell, and the magwell covers. Then insert a flywheel cage, may need to be wired in place. After the cage is installed, wired, and wheeled, add flywheel cage-cover and a motor cover of your choice. FLYWHEEL_CAGE-COVER.stl: The cover for the flywheel cage. Attaches to the flywheel cage-cage, magwell, and magwell covers. STP file is available on thingiverse, I don't feel like zipping it to include it in the post ATM.